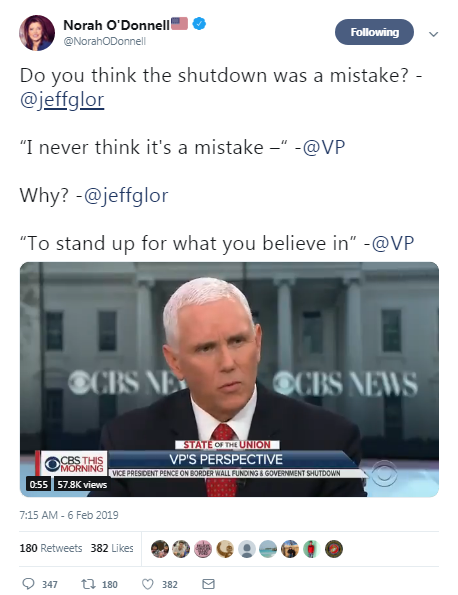 Wanted to make sure you saw that Vice President Mike Pence said the Trump-McConnell shutdown was not a mistake. The shutdown meant 800,000 Americans missed two paychecks, thousands of contractors went unpaid, and the American people who rely on government services suffered. Not only that, but the shutdown cost the economy $11 billion. Yet again, the Administration is signaling that they believe threatening to inflict pain on the American people is a legitimate strategy. You can bet House Democrats and the American people will hold them accountable if they shut down the government again.